Poll: Biggest Surprise Among Non-Qualified Free Agents? When the deadline to issue qualifying offers to restricted free agents comes and goes each year, there are always a few surprises on the list of those who did not receive an offer. For both those players and teams across the league, it can often be a shock that those players are suddenly unrestricted free agents able to sign with whoever they like. Oftentimes, not receiving a qualifying offer does not automatically mean that the player and his team are through. Already this year, defensemen Derrick Pouliot, Ryan Murphy, and Joe Morrow and forwards Riley Sheahan and Phil Di Giuseppe were not tendered an offer, but soon after signed with their respective squads. Yet, this year has also left more notable names than usual to be scooped up by another team come July 1st. Robin Lehner, the 26-year-old starting goaltender for the Buffalo Sabres, was one of the earliest known players to not be qualified. Whenever a starter hits the open market it can draw attention, but it’s much more surprising when that starter is both young and experienced. Lehner has seen regular NHL action for the past five years, some as a backup or “1B” with the Ottawa Senators and others as the “1A” for Buffalo. Granted, Lehner has had his fair share of difficulties, both staying healthy and performing when he is on the ice, but it came as surprise that the rebuilding Sabres were so willing to move on from their young keeper. In each of his first two seasons in Buffalo, Lehner posted a save percentage of .920 or better and a majority of his appearances were quality starts. Only this season did those numbers drop off, but apparently that was enough for Buffalo to cut him loose. With Chad Johnson also a free agent, the Sabres head into the off-season lacking any true NHL-caliber goalies on the roster. Anthony Duclair, just 22 and a former 20-goal scorer, was another surprise that many did not see coming. In his sophomore season in the NHL in 2015-16, the 20-year-old Duclair played in 81 games for the Arizona Coyotes and registered 44 points, good enough for fourth on the team. The young winger even garnered Calder Trophy votes. However, last season his play fell off substantially and this year was only marginally better, prompting a mid-season trade to the Chicago Blackhawks. Many opined that a change of scenery would be good for Duclair, who has shown great talent but needs to put it all together on a more consistent basis. Yet, Chicago gave the experiment 23 games before deciding to move on. A team with major cap problems who is always in need of affordable scoring let a young goal-scorer with years left of team control remaining walk in free agency after less than half a season. Tobias Rieder, a 25-year-old two-way forward, found himself in a similar situation. Rieder was traded to the Los Angeles Kings ahead of the NHL Trade Deadline and played well in his limited role down the stretch for the Kings. However, it wasn’t enough as Rieder was curiously non-qualified after just 20 regular season games in L.A. Before that, the well-rounded forward had played a major role in the forward corps of the Arizona Coyotes. Rieder has recorded more than 20 points in each of his four NHL seasons and has been a double-digit scorer in each year as well. The young German winger plays a smart, physical style and has an innate ability to crash the net and light the lamp. At 25, he still has room to grow and has 20-goal potential in the right situation. The Kings passed up a chance to take a longer look at what Rieder can do and, of course, have scoring winger as their biggest need this summer. Dylan DeMelo, the 25-year-old defenseman most recently of the San Jose Sharks, is a hard one to understand as well. DeMelo seemingly did everything he was asked of in San Jose, but found himself a free agent anyway. DeMelo had worked to carve out a role for himself with the Sharks in his first two seasons with the team, but in 2017-18 seemed to have found his place. The young defender skated in 63 games and set a new career high in points by a wide margin with 20. While DeMelo is not an offensive juggernaut by any means, he is solid defensively and was a nice complement on the blue line to the many other talented defenders in San Jose. Even if the Sharks were worried about committing too much money to defense or wanted to give some more time to other even younger options, it is hard to imagine that they couldn’t have found a taker for DeMelo on the trade market. What do you think? Who is the biggest surprise among the RFA’s that did not receive qualifying offers this year and now find themselves looking for a new team this summer as a UFA? Wednesday: The team has officially announced the contract, bringing back Morrow for one year at $1MM. Tuesday: A team declined to extend a qualifying offer to a restricted free agent defenseman who had been a good fit, only to re-sign him to an affordable one-year deal. Sound familiar? Less than an hour after the Vancouver Canucks re-signed Derrick Pouliot to an extension, the Winnipeg Jets have followed suit with a new contract for Joe Morrow. TVA’s Renaud Lavoie reports that Morrow has signed a one-year, $1MM extension to remain in Winnipeg. Like Pouliot, Morrow does not lose out on not getting a qualifying offer by yesterday’s deadline. The 25-year-old defender made the league minimum $650K last year, making a new million-dollar pact a substantial upgrade. In fact, it is almost a surprising raise for Morrow. The young journeyman, who was drafted by the Pittsburgh Penguins and traded to the Dallas Stars and then to the Boston Bruins before even making his NHL debut, was on his third team in two years when he finished the 2017-18 season with the Jets. Boston had declined to qualify Morrow last summer, only they intended to let him walk as a free agent. Morrow signed with the Montreal Canadiens and posted a career high in games played and points while also showing some defensive improvements. However, Morrow was still less than a full-time player and his move to Winnipeg was more of an afterthought depth addition at the time of the NHL Trade Deadline. Morrow was solid albeit unspectacular down the stretch for the Jets and was used only sparingly in the postseason. With that said, the Jets were vocal about how pleased they were with Morrow’s acquisition. The Winnipeg front office and coaching staff clearly saw enough of the puck-moving defenseman to decide on using some of their precious cap space to bring him back. The Jets face a daunting number of restricted and unrestricted free agency conundrums this summer, but seemingly worked quickly to get a deal done with Morrow. With four veteran defenseman signed for next season and three more qualified as RFA’s, Winnipeg has plenty of depth on the blue line, but must have plans to use Morrow in some capacity next season. Yet another example of a restricted free agent not receiving a qualifying offer only to sign an extension with his team anyway, the Vancouver Canucks have announced a new deal with defenseman Derrick Pouliot. The contract is for one year and worth $1.1MM. While this is a great deal for the Canucks, it is also well above the value of Pouliot’s would-be qualifying offer, showing that the offer’s absence was just a formality of ongoing negotiations. Pouliot, 24, finally landed a full-time NHL role last year in his fifth pro season. The eighth overall pick in 2012 had struggled to find his spot with the Pittsburgh Penguins for years, leading the two-time defending champs to trade him away last summer for the relatively underwhelming package of Andrey Pedan and a fourth-round pick. Pouliot arrived in Vancouver eager to show that he was better than the part-time player he was in Pittsburgh. He did just that, skating in 71 games for the Canucks and recording 22 points along the way. Pouliot trailed only Alexander Edler in terms of points and assists among Vancouver defenseman and was not only the best possession player on the blue line, but behind only Daniel and Henrik Sedin in Corsi. This is why many were surprised when it was reported that the Canucks had not extended a qualifying offer to Pouliot yesterday. The young rearguard is clearly a key piece for Vancouver and likely a part of GM Jim Benning’s long-term plan. 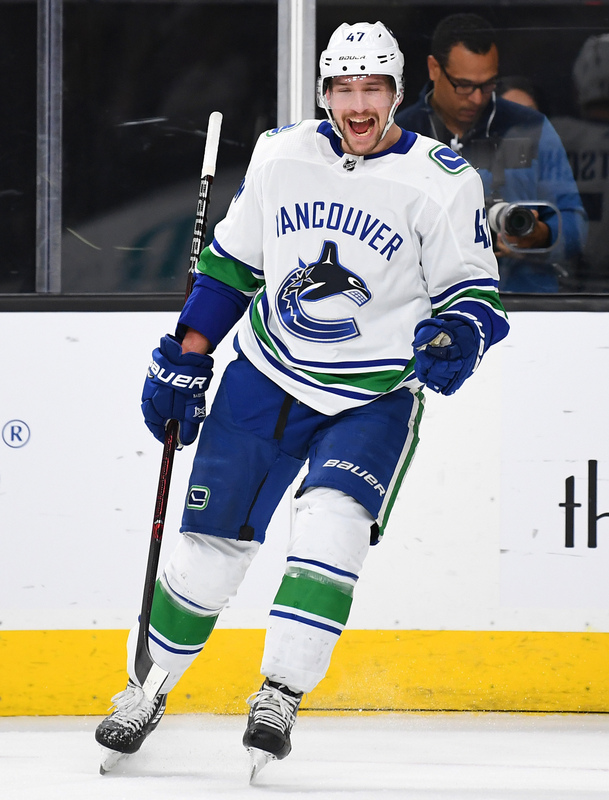 Pouliot’s extension may only be for one more year, as the team continues to evaluate his overall game and work on improving problem areas, but it stands to reason that Pouliot could bridge the gap between Edler, a 2019 free agent, and top prospects Quinn Hughes and Olli Juolevi as the primary puck-mover and offensive catalyst on the Vancouver’s back end. After a wild night in which the Pittsburgh Penguins, Ottawa Senators, and Vegas Golden Knights put together one of more complex trades in recent memory (here’s a brief summary for those still confused), there are still some questions to be answered. Sportsnet’s John Shannon both asked and answered one of the most prevalent questions: why would the Knights get involved? Rather than simply trading cap space for some minor assets, GM George McPhee’s motivation was a little more devious. Shannon states that McPhee knew Brassard was headed out West, likely to the Winnipeg Jets, unless he could intervene and help him stay in the East. So, not only did Vegas get a player and pick, but they also weakened their playoff competition. That player, Ryan Reaves, was likely no coincidence either. The 31-year-old enforcer has hardly inspired any team to pursue him with his production in 2017-18. However, as Sportsnet’s Chris Johnston points out, Reaves played his junior hockey with the WHL’s Brandon Wheat Kings. His coach while he was there was none other than Kelly McCrimmon, the Assistant GM of the Golden Knights. Some have speculated that the Knights may try to flip Reaves, but given his connection to one of the men in charge, that may not happen. The 2018 fourth-round pick bound for Vegas also has a bit more value than initially suspected. The Athletic’s Seth Rorabaugh clarifies that the pick sent by Pittsburgh was the one acquired from the Vancouver Canucks for Derrick Pouliot last summer. Thus, the Knights will be picking at the top of the fourth round rather than the bottom. What about the prospect heading to Pittsburgh from Vegas? Tobias Lindberg is just 22 and has just six games on NHL experience, but is already used to being in the middle of major trades. Rorabaugh recalls that Lindberg, an Ottawa fourth-rounder in 2013, was shipped to Toronto in the massive Dion Phaneuf trade. He then ended up in Las Vegas when the Leafs acquired Calvin Pickard earlier this year for Lindberg and a sixth-round pick. Finally, the Ottawa Senators are surely happy to have another first-round pick and one of the top goalie prospects in the world now in their grasp, but the stock-up of picks and prospects from this trade won’t end there. TSN’s Pierre LeBrun reports that the Sens have been receiving calls all day about Ian Cole, the other piece added from Pittsburgh. Ottawa will surely flip the solid rearguard by Monday’s deadline. What will the Minnesota Wild do with one of the top up-and-coming prospects? In an extensive mailbag column, The Athletic’s Michael Russo (subscription required) writes that he believes the Minnesota Wild will base its decision on how to proceed with Boston University prospect Jordan Greenway will depend on whether the Wild are in a position to compete for a playoff spot when Greenway’s season is done. Greenway, the team’s 2015 second-round pick is having another solid season at BU. He has eight goals and 11 assists in 23 games so far this season. Minnesota, who is two points out of a playoffs spot at the moment, would likely sign Greenway and immediately add the 20-year-old wing to their roster and burn his first year of his entry-level contract if the team was competing for a playoff run. However, Russo adds if the team falls out of the race, they would be more likely to let him go to Iowa of the AHL before coming to Minnesota next season. Russo adds that to sign him, the team will have to move out a contract as they are already at the maximum of 50. Also in another mailbag series, The Athletic’s Jeremy Rutherford (subscription required) writes that despite rumors that St. Louis Blues goaltender Jake Allen’s game has slipped ever since he took a hit to the head in late December, he doesn’t believe that is Allen’s problem. The scribe writes that Allen passed his concussion protocol that evening after sustaining the hit and said he felt fine once he got on his feet and while passing a test doesn’t mean anything, Allen practiced immediately the next day and hasn’t missed a practice since. He says it’s highly unlikely that the team would have allowed him to practice, let alone return to the game, if his head was still a concern. Mercury News’ Paul Gackle writes that starting goaltender Martin Jones is listed as day-to-day after suffering a lower-body injury during Thursday’s game against Colorado. Jones was seen with a significant limp after that game. Head coach Peter DeBoer said the injury is unrelated to the injury the netminder suffered back on Nov. 25 which forced him to miss a game. The coach referred to the injury as “minor.” Jones, who has struggled in net since that first injury, has a .886 save percentage in the 13 games since then. Backup Aaron Dell will take his place for tonight’s match against Pittsburgh. Sportsnet’s Rick Dhaliwal tweets that Vancouver Canucks defenseman Derrick Pouliot, who was scratched in the team’s last three games, has been dealing with a hand injury and is almost ready to return to the lineup. The 24-year-old defenseman is finally getting playing time with Vancouver after several years of struggling to break into the Pittsburgh Penguins lineup. The Canucks acquired the former first-round pick just before the season began. He has played in 39 games and has a career high of 11 points so far. A disappointing season for the two-time defending Stanley Cup champion Pittsburgh Penguins just took another tough turn. The team announced this afternoon that defensemen Kris Letang and Chad Ruhwedel and forward Bryan Rust have all been placed on injured reserve. There had been indications of possible moves such as these earlier in the day when head coach Mike Sullivan stated that Ruhwedel was “week-to-week” with an upper-body injury and Rust was out long-term with an upper-body injury of his own, as well as confirmed that Letang would remain out of the lineup, but the reality of three starters hitting the shelf on the same day could be jarring for Penguins fans. In corresponding moves, the team has recalled defenseman Andrey Pedan, forward Garrett Wilson, and goaltender Casey DeSmith after previously calling up rearguard Frank Corrado earlier in the day. Pedan could potentially be making his Penguins debut soon after coming over from the Vancouver Canucks this summer in the Derrick Pouliot trade. Between the 6’5″ Pedan and newly-acquired 6’7″ Jamie Oleksiak, the Penguins certainly have some size on the blue line right now. However, with both Letang and Justin Schultz out of the lineup, it will likely be the more offensively-inclined Corrado looked to for a greater impact. Up front, Wilson seems more likely to be an emergency depth option or occasional fourth-line contributor than any sort of replacement for Rust. The 26-year-old has zero points in 34 NHL games. If scoring becomes a problem with both Rust and Letang now sidelined long-term, it could be time for Daniel Sprong to make his much-awaited return to Pittsburgh. The most interesting impact of these injury moves could be the effect on the trade status of Letang. The All-Star defender’s availability has been a hot topic recently, but these new health concerns added to the career laundry list for the oft-injured defenseman will surely be a factor in talks. Earlier today, Vancouver Canucks coach Travis Green revealed a fact too familiar to Canucks fans: Chris Tanev is injured. Green told the press that Tanev had been sent back to Vancouver from the team’s current road trip due to an upper body injury. Canucks beat writer Iain MacIntyre has since added that early indications are that Tanev, Vancouver’s top defenseman, could be out two to three weeks with his newest ailment. The specifics of Tanev’s injury remain unknown, but given this relatively lengthy timeline, more should be known soon. Durability continues to be a major concern for the 27-year-old Tanev. The reliable two-way defender is as solid in his own end as they come, but as the old adage goes “the best ability is availability”. Now playing in his eighth season, Tanev has never played in more than 70 games in a season. Over the past four years, since Tanev truly became a regular blue liner in Vancouver, he has missed 72 games – nearly a whole season – due to injury. In fact, the 2016-17 campaign was his worst yet, as Tanev only managed to skate in 58 games and recorded a total of only 10 points. Fortunately for Vancouver, the blue line has not suffered the same injury bug (so far) this year as they did last year. Tanev’s absence was felt in a major way in 2016-17, as Erik Gudbranson missed all but 30 games and both Alexander Edler and Ben Hutton were sidelined for 10+ games. Edler has been out of the Canucks lineup recently, but is ready to return, alongside a healthy Hutton and Gudbranson and newcomers Michael Del Zotto, Derrick Pouliot, and Patrick Wiercioch. That grouping isn’t without issue, but stands a better chance of surviving the loss of Tanev, as well as young Troy Stecher, than they did last season.